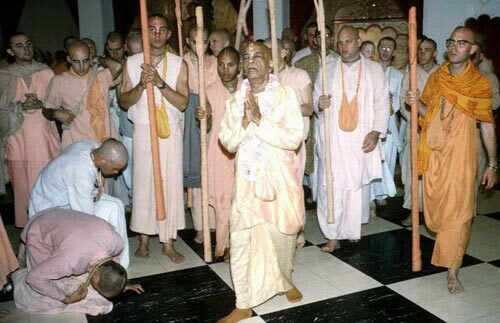 I became a devotee in October or November of 1971 when I joined the ISKCON temple in Boston, USA, although I had been living eight hundred miles away near the city of Detroit. How I came to join the Boston temple is an interesting story. I was living with some friends in a house on the outskirts of the greater Detroit area. I'd seen the devotees a few times and learned the maha-mantra. I was attracted but was still too absorbed in my own speculations to commit myself to Krsna consciousness. Then at about 18:00 one day in downtown Detroit, I saw the devotees on harinama. On an impulse, I joined their kirtana. They invited me to the temple, so I went back with them in their van. That was my first visit inside of an ISKCON temple. I attended arati, evening class and afterwards took a little prasadam. It all seemed so strange yet wonderful. I was impressed by the brightness, cleanliness and purity of everyone and everything. Before I left that night I bought a Back to Godhead Magazine. Back home with my friends, I read the magazine over and over. After a few days I decided I should move into a temple -- but because of my speculative tendency, I thought I should go to the temple in Boston, not Detroit. I had noted that the BTG was published in Boston. I found the magazine very illuminating and concluded that the Boston devotees must be big philosophers. I thought myself a big philosopher too, so I wanted to be with others of the same caliber. In reality, I was just a proud fool. Anyway, Krsna was kind to me. But I did not have much money and it was late autumn -- any day the cold winter winds would start to blow. So how could I carry out this mad plan of traveling eight hundred miles across the USA from Detroit to Boston? The same day I decided I wanted to go to Boston, a friend who drove a long-distance lorry visited the house. He mentioned that tomorrow he had to drive his truck to Boston. Krsna provided me with a free ride! After a few weeks in the Boston temple, I became a little serious by the mercy of the devotees, and decided to commit my whole life to Krsna. My moving into the temple was initially just an experiment. At first I planned to leave after 3 months or so, after I had "become spiritual." But the Boston devotees saved me from my crazy speculative mind, and I ended up staying for good. Chicago ISKCON temple, summer 1975. On Srila Prabhupada's right are HH Visnujana Swami, HH Satsvarupa dasa Goswami, HH Sudama Swami. To his Divine Grace's right are HH Brahmananda Swami and HH Tamal Krsna Goswami. I am standing at the far left. Srila Prabhupada was very kind to me when I first saw him. That was in Boston, summer 1972. I was asked by the vice-president to serve Srila Prabhupada prasadam. Being only a bhakta, I was very nervous of offending His Divine Grace, but Prabhupada so mercifully encouraged me. On three occasions during his short stay in Boston he showed me that he knows the inside of my heart. I could not help but accept him as my eternal spiritual master after this. Then a few years later, in New York, he showed appreciation for the service I had rendered to him as a book distributor. Actually, Srila Prabhupada has been so merciful to me throughout all my years in ISKCON. Considering this, I am simply astonished. Without him, I would be lost. By my own nature, I am, not a devotee at all. If anybody sees me as a devotee, what they are really seeing is just Srila Prabhupada's mercy.